Punjab Examination Commission PEC is the Self-governing body to commence the 8th class annual examination in the All Punjab Districts by the Punjab Govt. All Candidates are expecting their 8th class result announcement in this month because of the Last year announcement dates, Last year Result was announced on 31 March 2019 by the PEC Punjab Board. All candidates are right about the Result announcement dates because Punjab Examination commission PEC has decided to announce its 8th class Result on 31 March this year as they announce before all year. PEC Punjab Examination Commission were announced their Date Sheet of 8th class 2019 in the month of December 2019 and their exams were commence in the month of February during next year. After the Annual Examination of 8th class 2019 all candidates are waiting for their Result of 8th class Grade VIII announcement day. 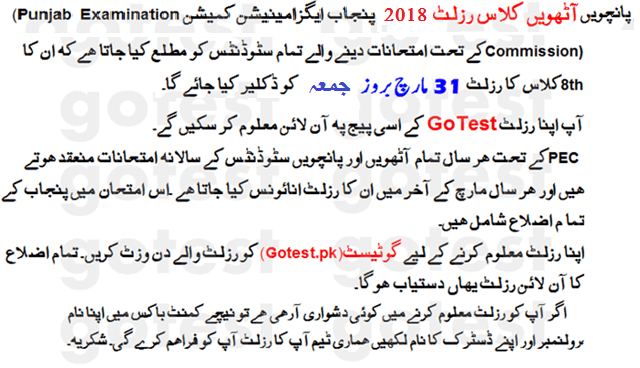 Punjab Examination Commission PEC will announce its result on 31 March 2019 on 09:00 Am so you all candidates are advised by us that you should keep stay with us here on this page because here we are providing you the official result before all other sources. PEC Punjab Examination Commission Punjab is require the only registration to appear in the 8th class examinations. No admission form is required later on after the registration. On the basis of registration all students from Government schools, private schools and private candidates are issued roll numbers to appear in the examination. Generally registration starts after summer vacation and all candidates can get registration through prescribed forms available at education offices in their respective districts or can be downloaded from here. PEC issue its roll Number slips 1 week before the Examination Commencement every year, Punjab Examination Commission issues roll numbers and sends to the districts for verification. After verification and changes made by the districts PEC issues final Roll Number Slips to each district which are delivered to schools and private candidates. PEC does not register any student in any case. Registration is done only by district education departments.